Chicken stew yum | ___is black the new black? Finally uploaded photos from my digital camera onto Flickr. This, dear reader, was a miraculous dinner. I had the original Ina Garten recipe in my files and had almost forgotten its existence until I had reorganized my loose recipes. 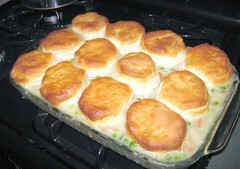 Anyhow the original calls for way too much butter, cream, making your own biscuits, roasting the chicken, etc. I adapted it somewhat. Used a rotisserie chicken I had in the fridge. Just took off the skin and shredded/chopped it roughly. I halved the amount of butter and it worked just fine. The rest of the adaptations I made are listed above. I also did not make my own biscuits. Instead I used the no name supermarket large biscuits in a roll. I’m sure it’s even better with homemade biscuits. It made a ton so it fed my neighbor, my mom, and me for multiple nights that week. Would totally make this again.